Canadian Ryan Cochrane started off the evening by setting a new competition record in the men’s 800 freestyle winning the event in a time of 7:52.51 beating the old mark of 7:58.32. The time is a season’s best for Cochrane who is preparing to move higher up on the medal podium in Kazan after collecting a bronze in the event at the 2013 World Championships in Barcelona. Stephen Milne of Great Britain finished second in a time of 8:56.12 followed by South African Myles Brown who posted a time of 8:58.35. Georgia Davies of Great Britain took the women’s 50 backstroke in a time of 27.97, which is a tenth of a second off her season’s best of 27.87 which currently ranks fifth in the world. 100 backstroke gold medalist Mie Nielsen of Denmark finished 11 one-hundredths of a second behind Davies recording a time of 28.08. Davies British teammate Lauren Quigley finished third in a time of 28.40. Current world record holder Adam Peaty of Great Britain and former world record holder South African Cameron van der Burgh went head to head in a race that was decided by four one-hundredths of a second. When the two met in the 50 breaststroke at the Commonwealth Games in Glasgow last summer it was van der Burgh who nudged Peaty off of the top of the podium winning the event by two one-hundredths of second, but today the order was reversed. Peaty hit the wall in a time of 27.25 followed by van der Burgh who finished in a time of 27.29. Both men finished under the previous competition record of 27.48 set by Andrei Nikolaev last year. Sami Aaltomaa of Finland collected the bronze posting a time of 27.67. After winning the women’s 100 butterfly yesterday Jeanette Ottesen of Denmark collected another gold in the women’s 50 butterfly taking the event in a time of 25.51. Ottesen was just off her season’s best of 25.48, which she posted in March. Inge Dekker of the Netherlands finished second in a time of 25.72, which beats her season’s best by two one-hundredths of a second. Fran Halsall of Great Britain finished third in a time of 26.03. Kosuke Hagino of Japan, who currently sits atop of the world rankings having posted a 4:08.54 in April, took the men’s 400 IM recording a winning time of 4:11.78. He was followed by Hungarian David Verraszto who posted a 4:13.68 and German Jacob Heidtmann who finished in a time of 4:18.21. Femeke Heemskerk of the Netherlands has had a fantastic year, currently ranked number one in the world in both the 100 and 200 freestyle, continued her winning ways in Barcelona. Heemskerk led the women’s 100 freestyle from start to finish, turning in a split time of 25.96 and finishing in a time of 53.25. Heemskerk set a new competition record beating the old mark of 53.87 set by Libby Trickett in 2009. Heemskerk’s Dutch teammate Ranomi Kromowidjojo took the silver posting a time of 53.84 followed by Pernille Blume of Denmark who finished in a time of 54.28. Ryosuke Irie of Japan took the men’s 100 backstroke with relative ease recording a time of 53.23 finishing over a full second ahead of Christopher Walker-Hebborn of Great Britain who sits atop of the world rankings. Walker-Hebborn collected the silver finishing in a time of 54.26 followed by Irie’s Japanese teammate Masaki Kaneko who hit the wall in a time of 54.60. Once again Rikke Moller Pedersen of Denmark and Kanako Watanabe of Japan went head to head and once again Pedersen cam out on top. The Dane took the women’s 100 breaststroke in a time of 1:07.07 followed by Watanabe who posted a 1:07.53. Jenna Laukkanen of Finland took the bronze in a time of 1:07.82. Laukkanen broke her own Finnish national record of 1:08.55 which she posted at the Finnish Championships in April. Katsumi Nakamura of Japan took the gold in the men’s 50 freestyle hitting the wall in a time of 22.30. He was followed closely by Konrad Czerniak of Poland who touched in a time of 22.34 and Ben Proud of Great Britain who finished in a time of 22.40. Hungarian Katinka Hosszu led the women’s 200 backstroke from start to finish posting a winning time of 2:08.41. Canadian Hilary Caldwell made a push in the final 100 meters of the event, but still finished close to a full second behind Hosszu posting a time of 2:09.36. Elizabeth Simmonds of Great Britain collected the bronze finishing in a time of 2:10.14. German Marco Koch, who had an impressive win in the men’s 200 breaststroke in Canet posting a 2:08.57, took the event tonight in Barcelona in a time of 2:09.35. Koch finished ahead of Yasuhiro Koseki of Japan, who currently has the world’s top ranked time of 2:07.77, who posted a 2:10.60. 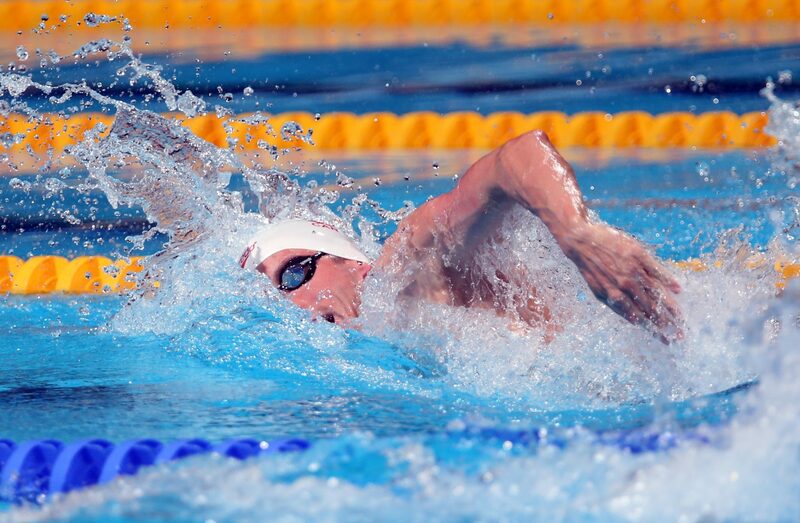 Olympic silver medalist Michael Jamieson of Great Britain finished third in a time of 2:11.42. Natsumi Hoshi took the women’s 200 butterfly in a time of 2:07.58, well off her season’s best of 2:06.66. Hoshi did break her own competition record of 2:07.76, which she posted in 2008. Spaniard Judit Ignacio finished second in a time of 2:09.59 followed by Aimee Willmott of Great Britain who hit the wall in a time of 2:11.00. Czerniak, who currently sits atop of the world rankings with a time of 51.37, won the men’s 100 butterfly in a time of 52.36. The Polish swimmer led the race from start to finish, turning in a split time of 24.30. Takeshi Kawamoto of Japan finished second in a time of 52.57 followed by his Japanese teammate Takuro Fujii who collected the bronze in a time of 52.69. Siobhan-Marie O’Connor of Great Britain took the women’s 200 IM in a time of 2:09.56, just missing her season’s best of 2:09.51 which currently ranks second in the world. O’Connor did break her own competition record of 2:09.63, which she posted last year. American Melanie Margalis who hit the wall in a time of 2:10.85 and Hosszu who finished in a time of 2:12.23. Yuki Kobori of Japan took the men’s 200 freestyle out with blazing speed, turning at the halfway mark in a time of 51.73 half a second ahead of James Guy of Great Britain and a second ahead of South African Chad le Clos and Sebastiaan Verschuren of the Netherlands. Kobori held the lead heading into the final 50 meters, but did not have enough to hold off Verschuren, le Clos or Guy. Verschuren took the event in a time of 1:47.52 followed by le Clos who hit the wall in a time of 1:47.75 and Guy who finished in a time of 1:48.01. Jazz Carlin of Great Britain won the women’s 400 freestyle with relative ease posting a time of 4:06.97. Carlin turned at the 200 meter mark in a time of 2:03.97 and followed that up with a 2:03.00 split for the second half of the race. Fuewi Dong of China took the silver in a time of 4:09.77 followed by Hannah Miley of Great Britain who touched in a time of 4:10.18. You can watch the event live here: http://divxmozi.eu/tv/digisport1.htm (the quality is not that good). You can close the ad in the front after a few seconds. It is a pain because the ad will open in a large window and you need to close that too. But after about three trials the ad wil disappear. During medal ceremony they show something else. Good luck! One of the first events she was 4:31 in the IM. By the end of the meet, 2:12 in the shorter IM.